Roseville resident and Sacramento Republic FC Academy U18 midfielder Ryley Kraft was selected to train with the U.S. Men’s U-19 National Team during the team’s domestic camp in Sunrise, Florida this past week. 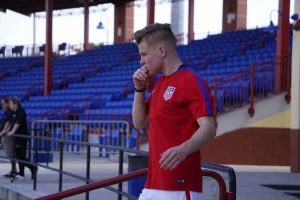 The local soccer standout made a name for himself with the U.S. U-19s as they played a pair of friendlies against El Salvador and Miami FC, Feb. 3-10. This is Kraft’s first call up to the ranks of the U.S. Youth National Team. The midfielder has made 16 appearances with Republic FC’s U-17/18s team during the 2016-2017 U.S. Soccer Development Academy season, starting in 13 of those games and registering six goals. Kraft, who spent over a half decade competing for the Placer United youth teams, earned a national team bid via participation in the U.S. Development Academy. In his team’s opening game, Kraft found the net in the 62nd minute of action as he tied the game at 1-1 with a header. His goal came after a penalty from El Salvador in the final third and a place kick from the far side of the field. Kraft was the beneficiary of a deflection from his teammate as he swarmed to the net and finished off the play. With his participation this week, Kraft could be called to compete for the national team again, this time for an international competition. “I’ll have to wait and see if I’m selected, but it’s definitely a possibility,” he added. Already a high school graduate, Kraft will play the rest of the season with the academy team in hopes of earning a contract, but he’s also considering the prospect of playing soccer at the collegiate level next year. Kraft returns home Friday from his National Team bid and will rejoin the academy as the Republic get set to host the Seattle Sounders FC U-17/18s at Cosumnes River College Saturday, Feb. 11.